This next recipe is a classic that every cook needs to have in their back pocket for a quaint dinner party at home. Served with crisp steamed asparagus, filet of beef with red wine sauce makes for a beautiful presentation and an irresistible meal. 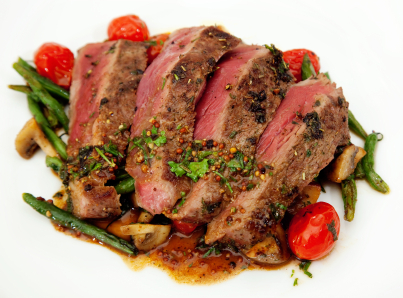 As with any recipe, this one tastes best when prepared with quality, hormone-free, platinum reserve beef. If you’re interested in finding out more about our gourmet food delivery service and how you can request a free food sample click here. Passanante’s Home Food Service would love the opportunity to deliver quality meats and organic vegetables to your home and save you time by reducing pesky grocery store trips! Serve this mixture over hot meat with noodles. This entry was posted in Beef, Recipes and tagged Food Delivery Service, Hormone-Free Meat, Passanante's Home Food Service, Platinum Reserve Beef, Recipe, Red wine sauce by Passanante's Home Food Service. Bookmark the permalink.